I’d always thought that YSL or Yves St. Laurent Beaute was very old school in terms of makeup. It was something that “aunties” used. But that was until I got my hands on their duo eyeshadows. YSL eyeshadow duos come in square pans in a sturdy plastic case, with 2 sponge tip applicators and a large mirror in the cover. I don’t like applicators that are packaged with the product so I usually have nothing good to say about them. Further, I tend to use my fingers to apply my eyeshadows. Which brings me to the quality of the eyeshadows – par excellance! I was not expecting too much from them to be honest. But I was blown away by the quality. The eyeshadow feels hard to the touch, but the colour is easy to pick up and deposit. The colour pigments tend to be on the slightly sheer side, but its easy to build up colour. Darker shades show up better and having a slightly sheer texture means you are less likely to make mistakes. The duos have a slight shimmer to them which is very nice. They are glittery or super shimmery but simply impart a slight shimmer which means you could use them for work without attracting too much comment. The pigmentation is good which means the colours are pretty much true to whatever you see in the pan. I believe they might have changed the packaging of the duos and I cannot recall the price as I got most of mine during a sale. 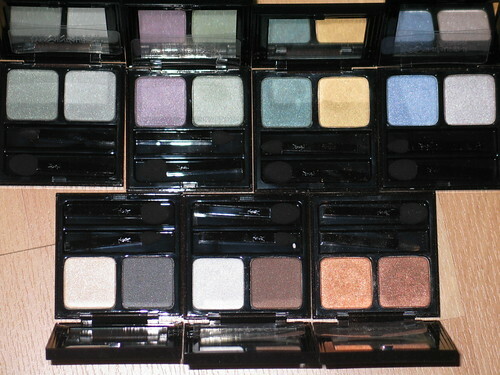 I’d say that YSL eyeshadow duos are pretty much under-rated and deserve a second look. I completely agree, I have the number 7 from last autumn and I just love it. In fact I am writing about this today on my blog and came across yours trying to find a picture of the colors. I will look more at your blog in my free time. Thanks for the write it, very cool!